Once synonymous with the high end, HTC's Desire brand now speaks of the mid range with handsets the new HTC Desire 601 which hopes to bridge the gap between feature- and smartphone with aplomb. It comes with high-end bits and bobs like LTE connectivity and a 4.5-inch screen coupled with mid-range display quality (qHD), RAM (1GB) and processing (a Snapdragon 400 dual-core 1.4GHz affair). 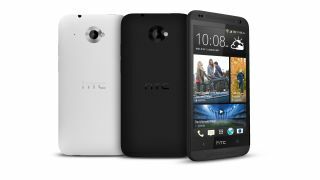 HTC has packed its latest in-house features into the Desire 601 too, including the three-second HTC Zoe video maker and the excellently-named BoomSound audio set-up, which basically means it has dual front-facing bass-friendly speakers. It also features Beats audio enhancement, thanks Dre. Storage-wise we're looking at 8GB on board plus microSD support, which is just as well since the 5MP camera can shoot 1080p video and that takes up a fair bit of space. The 4.5-inch device weighs a fairly standard (for this level) 130g, which is about the same weight as the Samsung Galaxy S4. HTC Desire 601 pricing is yet to be revealed but we're HTC is pushing it as "affordable" so it shouldn't be too harsh on the bank balance, particularly on network deals. The handset will be released in Europe in September, with US and Australian availability yet to be confirmed.